The system Kepler-444 shown above formed when the Milky Way galaxy was a youthful two billion years old. The planets were detected from the dimming that occurs when they transit the disc of their parent star, as shown in this artist's conception. Observations of 74 Earth-sized planets around distant stars may narrow field of habitable candidates. Viewed from above, our solar system's planetary orbits around the sun resemble rings around a bulls-eye. Each planet, including Earth, keeps to a roughly circular path, always maintaining the same distance from the sun. For decades, astronomers have wondered whether the solar system's circular orbits might be a rarity in our universe. Now a new analysis suggests that such orbital regularity is instead the norm, at least for systems with planets as small as Earth. "Twenty years ago, we only knew about our solar system, and everything was circular and so everyone expected circular orbits everywhere," says Vincent Van Eylen, a visiting graduate student in MIT's Department of Physics. "Then we started finding giant exoplanets, and we found suddenly a whole range of eccentricities, so there was an open question about whether this would also hold for smaller planets. We find that for small planets, circular is probably the norm." "If eccentric orbits are common for habitable planets, that would be quite a worry for life, because they would have such a large range of climate properties," Van Eylen says. "But what we find is, probably we don't have to worry too much because circular cases are fairly common." In the past, researchers have calculated the orbital eccentricities of large, "gas giant" exoplanets using radial velocity — a technique that measures a star's movement. As a planet orbits a star, its gravitational force will tug on the star, causing it to move in a pattern that reflects the planet's orbit. However, the technique is most successful for larger planets, as they exert enough gravitational pull to influence their stars. 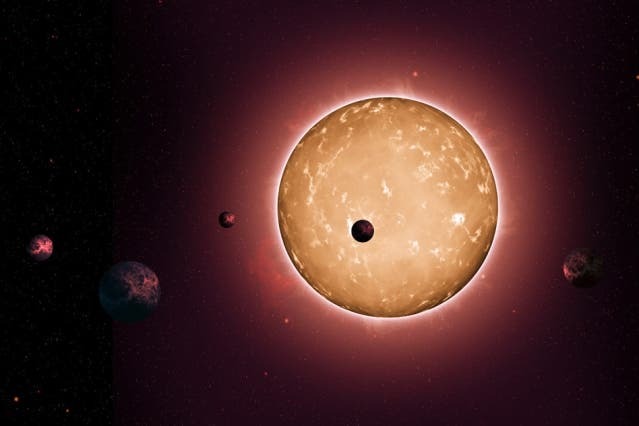 Researchers commonly find smaller planets by using a transit-detecting method, in which they study the light given off by a star, in search of dips in starlight that signify when a planet crosses, or "transits," in front of that star, momentarily diminishing its light. Ordinarily, this method only illuminates a planet's existence, not its orbit. But Van Eylen and his colleague Simon Albrecht, of Aarhus University, devised a way to glean orbital information from stellar transit data. They first reasoned that if they knew the mass and radius of a planet's star, they could calculate how long a planet would take to orbit that star, if its orbit were circular. The mass and radius of a star determines its gravitational pull, which in turn influences how fast a planet travels around the star. By calculating a planet's orbital velocity in a circular orbit, they could then estimate a transit's duration — how long a planet would take to cross in front of a star. If the calculated transit matched an actual transit, the researchers reasoned that the planet's orbit must be circular. If the transit were longer or shorter, the orbit must be more elongated, or eccentric. To obtain actual transit data, the team looked through data collected over the past four years by NASA's Kepler telescope — a space observatory that surveys a slice of the sky in search of habitable planets. The telescope has monitored the brightness of over 145,000 stars, only a fraction of which have been characterized in any detail. The team chose to concentrate on 28 stars for which mass and radius have previously been measured, using asteroseismology — a technique that measures stellar pulsations, which reflect a star's mass and radius. These 28 stars host multiplanet systems — 74 exoplanets in all. The researchers obtained Kepler data for each exoplanet, looking not only for the occurrence of transits, but also their duration. Given the mass and radius of the host stars, the team calculated each planet's transit duration if its orbit were circular, then compared the estimated transit durations with actual transit durations from Kepler data. Across the board, Van Eylen and Albrecht found the calculated and actual transit durations matched, suggesting that all 74 exoplanets maintain circular, not eccentric, orbits. "We found that most of them matched pretty closely, which means they're pretty close to being circular," Van Eylen says. "We are very certain that if very high eccentricities were common, we would've seen that, which we don't." Van Eylen says the orbital results for these smaller planets may eventually help to explain why larger planets have more extreme orbits. "We want to understand why some exoplanets have extremely eccentric orbits, while in other cases, such as the solar system, planets orbit mostly circularly," Van Eylen says. "This is one of the first times we've reliably measured the eccentricities of small planets, and it's exciting to see they are different from the giant planets, but similar to the solar system."